Can you believe it? It's the last day of 2010 already! We'll leave you something sweet to conclude this year with. Happy New Year from SimpleDreamer.com! The 8th Hong Kong Mega Showcase was held at the Hong Kong Convention and Exhibition Centre from 24 to 27 December 2010. The organizer has put together a collection of mini-shows and made it into a mega extravaganza that offers goods that cover almost every aspects of our daily lives. Cosplay or Costume Play is a hobby that has gained its popularity amongst teenagers and young adults. The idea is to dress up as a particular cartoon, video game or comic book character and take photos. It originated in Japan, where the comics and cartoon industry is huge. An art experience named, Touching Art: Louvre's Sculptures in Movement, is on display at the Hong Kong Museum of Art from 10 Dec 2010 to 20 Feb 2011. Visitors are encouraged to use their hands to touch and feel the Louvre's sculptures. Hong Kong is known for it's collection of outdoor light displays at night. During the Christmas and New Year period, commercial buildings and shopping malls put on extra efforts to light up the city. These lights and decors are usually on display from late November to early January. Elements, yet another giant shopping complex in Hong Kong, literally sets the foundation of extremely expensive residential real estates in Hong Kong. If you are into expensive properties at West Kowloon, here are the names that you must be aware of: The Waterfront, Sorrento Tower, The Harbourside, The Arch, The Cullinan; along with International Commerce Centre, which is the tallest building in Hong Kong at present, offering dear office space. The whole complex is built on reclamation ground. In late 2009, a semi-outdoor shopping complex named 1881 Heritage was opened at the water-front of Tsim Sha Tsui. It is on Canton Road (which is famous for having upmarket designer brands flagship stores) and within walking distance of the Star Ferry Pier, a prime location that every property developer wanted their hands on. This site was home to an historical monument, the former Marine Police Headquarters, from 1884 to 1996. In 2003, the Hong Kong Administration awarded the site to a particular property developer for commercial purpose at a price, and with an agreement that the historical building will be persevered. Located at the fringe of Tsim Sha Tsui, The ONE is one of the three new shopping complex in town. In terms of the overall concept, style, interior design and selection of stores; I believe The ONE is the best out of the four. The fact that it is not at the centre of Tsim Sha Tsui put it into a slight disadvantage. It is however in the "golden" shopping section of Nathan Road, making it convenient for shoppers. Located at the Status Square, opposite to the 98-year-old Legislative Council Building, and adjacent to the HSBC Hong Kong headquarters; the Prince's Building and Alexandra House are at the center of Hong Kong. The Prince's Building and Alexandra House need no other landmarks to put them on the map. For decades, they have made their name for having a collection of upmarket designer brands boutique stores in their shopping malls. This Christmas Tree might be ordinary; the building that it is in isn't any ordinary building. Hundreds and thousands of elites from the financial sector walk passed this Christmas Tree per day. It is located at the Exchange Square in Central of Hong Kong. The Hong Kong Tourism Board and Swarovski put together a 30m giant Crystal Christmas Tree in the Status Square of Central. A giant Chupa Chups vending machine (approximately one story tall) is currently on display at the front entrance of iSQUARE shopping and entertainment complex in Hong Kong. How sweet! This is certainly one huge Chupa Chups vending machine! These life size Lio and Stitch models are currently on display at the basement of the Miramar Shopping Centre in Tsim Sha Tsui, Kowloon. Seek your opportunity to take photographs with them! To y'all Snoopy's fans out there: I am thrilled that there were so many of you read my blog post on Snoopy's Land posted in November. Here are more information on the presence of these Peanuts characters in Hong Kong: Charlie Brown Cafe. I personally have never dined in this cafe. I just happened to walk passed the shop recently. What has caught my attention was the unique shop front and Mr. Brown's friendly face. Dialogue in the Dark, a social enterprise with a mission to raise the awareness of the daily challenges that the visually impaired (ie. the blind) faces, offers a great taste of darkness! In a 75 minutes indoor journey, visitors were soaked in complete darkness and were given an opportunity to maximize their other senses. Each small group of visitors is guided by an enthusiastic visually impaired guide They are more than happy to share insights of their world with you - the visitors. Dialogue in the Dark at Christmas! "Dialogue in the Dark" is a World Wide organization with branches in many countries, including: Austria, China, Estonia, India, Germany, Israel, Italy, Japan, Korea, Mexico, Singapore, South Africa, Thailand and USA. Visit their official website for more details. This is the Whangarei falls. The locals described the Whangarei falls as the most photogenic falls in New Zealand. If compared with the Huka Falls in Taupo, the Whangarei falls looked like a small garden hose. I am sorry Miss Photogenic but this is the truth. However, being small and tiny does have its advantage: visitors can get up close (and real close) with the Whangarei falls. Standing on the other side of the pond, we could cleanse our faces with the water drops in the air. There is a loop track around the Whangarei Falls, allowing visitors to have a closer look from different angles. Near the Huka Falls, there is a place downstream called Aratiatia Rapids. The Aratiatia Power Station is the first hydro-power station built on the Waikato River. The power company that operates the station opens the gates at regular intervals to suit the power generation needs. There are eight power generation plants along the Waikato River which generates 13% of New Zealand's electricity. Aratiatia is best know for it's scenic features. The lookouts were built on very hilly terrains. It was an amazing experience to observe water flows and twists on these rocky corners. An artist named Frederick Hundertwasser and a free public toilet put a small New Zealand town called Kawakawa on the tourist map. In all long distance driving, toilet stops are more than actions that satisfies one's physical needs. Toilet stops mark milestones of a journey and give something the passengers to aim for. Kawakawa's toilet stop is unique as it adds colour to your experience. Literally just down the road from the Huka Falls, there is a sweet little house that sells honey product. When I last visited, they called themselves "The Honey Hive". I believed they have changed their name to Huka Honey Hive. If there is one water fall that you must visit in New Zealand, it would be Huka Falls near Taupo. It is easy to access with lots of photo opportunities. Draining from the nearby Lake Taupo, Huka Falls is an important milestone of the mighty Waikato River. The Huka Falls are so powerful as the Waikato River narrows from 100m to only 15m just a few hundred meters upstream. The New Zealand government built footbridges and lookouts, making it easy for visitors to observe, hear and feel the power of the Huka Falls. Parking and admission is absolutely free. Tongariro Alpine Crossing, one of the "must visit" tramping tracks in New Zealand, is a great one day tramp destination. In that 6 to 8 hours of a rather comfortable journey, trampers will experience all sorts of volcanic terrains with a bit of native forest at the end. As you can find lots of photographs and descriptions about Tongariro Alpine Crossing online, let's talk about the logistics or planning details that you should be aware of. The Inno Design Tech Expo was held at The Hong Kong Convention and Exhibition Centre from 2 to 4 December 2010. It was an opportunity for the industry to showcase and exchange innovative design ideas. Furthermore, the general public can explore innovations by designers from Japan, Germany, France, Hong Kong and more. That's right, HONDA's ASIMO were there! It is without a doubt that the Japanese are World Class innovators and exhibitors. Working in teams, the Japanese have designed so many great products that simplifies life. They have also created arts that enrich life. The must see star exhibits of the event were ASIMO by Honda, Key Between People (KBP) by Yamaha and a capsule hotel room of 9h nine hours. 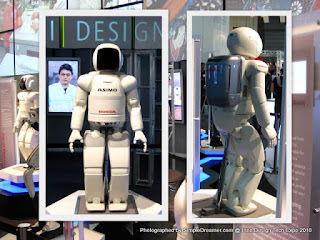 As you may be aware, ASIMO is a human like walking robot. KBP is an extremely thin flat piano that brings that audience and performer closer. 9 hours hotel modernized and added style to stack guests on top of each other with (quite frankly) coffin look-a-like capsule hotel rooms. You can see a video of some of these star products in the Japanese Inspirations II post. But wait! there's more! "Egg carton" walls surround the Germany display area. The Germans showcased an impressive collection of innovative designs. From the overall design concept of the show area to each exhibits, it is evident that every detail was carefully calculated and crafted. The Germans brought along products such as various household appliances, cutlery, an award winning unusual clock and of course a Mercedes-Benz. The local (Hong Kong) designers and university students showcased their work at the Expo. Out of all the designs and inventions from the Hong Kong Chinese, the following handbags were the most impressive. The Inno Design Tech Expo is currently being held at The Hong Kong Convention and Exhibition Centre from 2 to 4 December 2010. It is an opportunity for the industry to showcase and exchange design and innovative ideas. The general public can admire designs and innovations from Japan, Germany, France, Hong Kong (the locals) and a few other participating countries. As someone who loves creative ideas that improves lifestyle, I spent plenty of time at the Lifestyle and Design Pavilion of the Inspiration Hall. I had mixed feelings and went through an emotional roller coaster. I was both impressed and disappointed by the various exhibits. Whakatane, a small town on the East coast of New Zealand's North Island, is the gateway to an active volcano called the White Island. The town also offers local wild life tours and boat trips; making it a popular tourist spot. Whether you dare to walk on an active volcano, or you desire to swim with friendly wild dolphins; your dreams can come true at Whakatane. Do you dream to dive into the ocean and swim with wild dolphins? Your dream can come true in Whakatane, New Zealand. Whakatane is a small town on the East coast of New Zealand's North Island. It is the gateway to the White Island: an active volcano that became a popular tourist attraction. The town also offers local wild life tours and boat trips. On "The Strand“, the only main street in town (the locals might disagree :p), there are several shops that offers boat trips to watch and/or swim with wild life dolphins at a reasonable price. 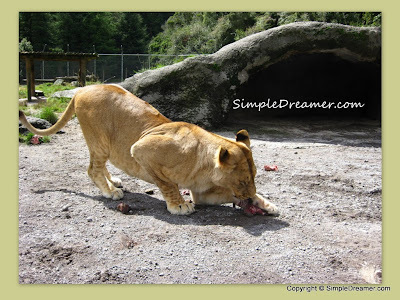 Fancy some lion feeding and lion fights when you are in New Zealand? Sniff around in the Bay of Plenty region! Paradise Valley Spings is a wildlife park located near Rotorua of New Zealand. It is a zoo operated by a sweet family. You can meet New Zealand birds, trouts, farm animals and a pride of African Lions at a small admission fee. If you wish to make your trip absolutely worthwhile, plan ahead to see the daily lion feeding at 2:30pm!